That’s right, I went back for more today, seeing as they’ve being keeping the pegs fully stocked lately. And lookey what I found! 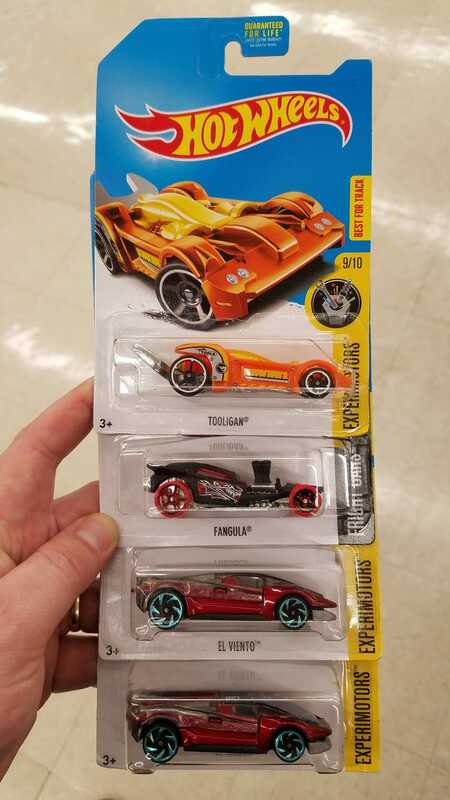 The Tooligan TH was just laying on the shelf along with a few other cars that looked like they all just got knocked off the pegs. Well that was an easy find, lol. Also found another Fangula TH. I already have one, but think it’s a really cool cast with everyone pinstripe ingredients and the rat-rod style. I figured someone on here might want it, so that’s available for trade. And the two El Vientos? I just got those to scavenge their wheels. That way I don’t have to rob a Tesla Model X instead, hahaha.